The CEO of SpaceX says humans could visit Mars as soon as 2024. Musk is a hot topic in the media these days. He recently unveiled a manned version of his successful Dragon spacecraft. He's talking about retrieving the first stage of his Falcon 9 rocket, a feat that has never been accomplished. And Musk is still a big fan of Mars exploration, as he says in the interview he hopes to see people walk on the planet in 10-12 years. Essentially what I was alluding to a moment ago was is to be able to recover the rocket booster and then refly it. That's the revolutionary potential. Now we have been trying to do that for 12 years, and haven't yet succeeded. But I feel as though we are finally close to achieving it. We have a shot with the next launch of recovering the rocket booster. If not with this launch, I think a very good chance later this year, and then potentially to refly the booster next year. This would really mark a significant change in the technology of rocketry. 'Threading the needle', the Falcon 9/Dragon vehicle passes through the catenary lightning wires as it roars from the pad on the CRS-3 mission. Credit: nasatech.net. Musk also spoke on what would happen if SpaceX does not get the next round of commercial crew funding from NASA. The company is right now being funded along with Boeing (CST-100) and Sierra Nevada (Dream Chaser), but NASA is still figuring out how many companies it can afford to back in the next stage, which will be announced later this year. 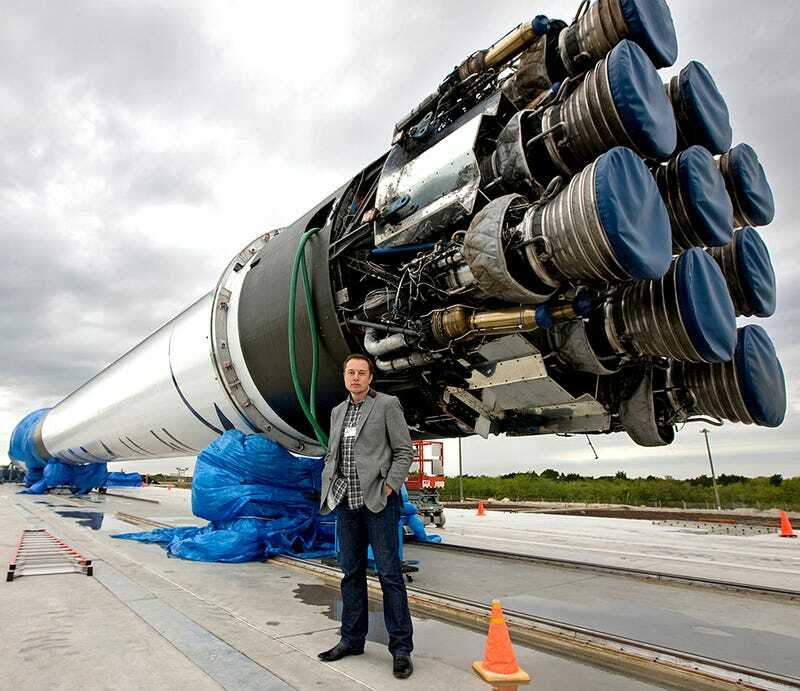 Musk revealed the manned prototype version of its Dragon spacecraft to great media fanfare in late May. Well it definitely would slow us down, but we would keep going and we should keep launching commercial satellites. We have an existing contract to transfer…from the space station so we would keep going. It just would be slower. Elon Musk seated inside Dragon V2 explaining consoles at unveiling on May 29, 2014. Credit: SpaceX. This is a very difficult thing, obviously. I'm hopeful that the first people could be taken to Mars in 10, 12 years. I think it's certainly possible for that to occur. The thing that matters long term is to have a self-sustaining city on Mars. To make life multi-planetary. That will define a fundamental bifurcation of the future of human civilization. We'll either be a multi-planet species and out there among the stars, or a single-planet species until some eventual extinction event, natural or man-made. The incentive structure tends to be short-term. You can trace it back to people that own the stocks, portfolio managers. They are evaluated on a quarterly basis, or at least an annual basis. They push companies to produce results on a quarterly or annual basis. With SpaceX we are trying to develop technology that will ultimately be able to take large numbers of people to Mars. That's really difficult to get portfolio managers. It's beyond their tenure in owning the stock. So it is difficult to ask them to like that. I think, probably, Mars. The car battery certainly is hard. I'm quite optimistic, though, about improvements in the battery price or the cost of the battery. The fundamental cost. We have daily meetings with Panasonic, our key development partner, on this. I am really feeling quite good about being able to produce a compelling mass market car in about three years. I mean, at this point, human life span is mostly about old age. It's not about cancer or anything else. If you cured cancer, I think the average life expectancy would increase from two years. You would go from 80 to 82, or something like that. We just have a genetic life span. It's kind of like if you take a fruit fly and gave it the best exercise and diet possible, the perfect life. Maybe it will live four weeks instead of three weeks. Genetics just drives a lot of these things. So for something to be truly disruptive on that front, you would want to do something with genetics. I don't have much involvement there. Or any involvement, really.